Paragliding tandem flight Annecy - France: Just do it ! Specialist of tandem flight in Annecy since 1994, trust our team to make your first Paragliding tandem flight Annecy ! Without previous experience, you can discover paragliding by making your first paragliding baptism with our instructors, all state graduates and with modern equipment. HOW IS YOUR first tandem flight PASSING INTO ANNECY ? That’s it, you decided to fly with us? Still some hesitation ? So let’s try to answer all the many questions you need to ask yourself before your Paragliding tandem flight Annecy ! 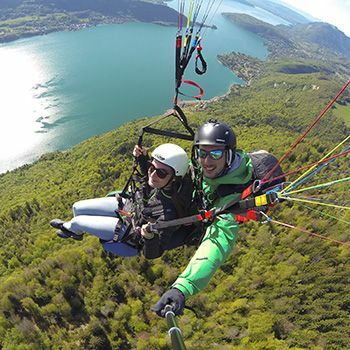 To make your first paragliding flight Annecy, it’s very simple, it will be necessary to go to the landing air of Doussard which is 30 minutes from Annecy along the lake. See you at our little cottage, which is just at the foot of Doussard landing, which is at the other end of the lake compared to Annecy. For this, there are several means of transport available to you : you can of course get there by car, but you can also go there by bike by the bike path, starting from our shop which is located in the city center of Annecy. If you are interested in bike rental, click here ! After making an appointment, to be sure to have a seat with one of our instructors, we advise you to arrive a good quarter of an hour in advance, this will allow you to take advantage of the landing site. Indeed, it’s really worth seeing the broom of the paragliders, if you have never done before ! Then, when it is your turn to get ready to go in the air, take a seat in our minibus and take off ! Once on the site, you will be entitled to a brief briefing from our instructor, who can also answer all your questions ! To summarize what the instructors will tell you : you will just run a few meters, always with your guide. This will allow you to find yourself in the air, then you will be securely hung under the paraglider as a bird ! From the first steps, you will feel the sail take care of you and at no time will you have the feeling of throwing yourself into the void !!! In the air for the first time : Here we go ! Once in the air, all you have to do is sit comfortably in the back of your seat, which is called the harness. 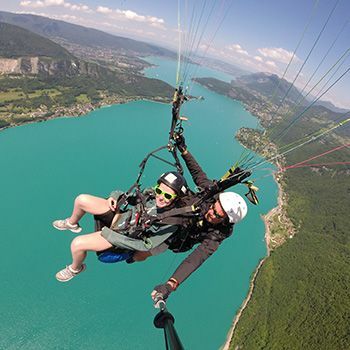 From the first second, you can enjoy your Annecy paragliding tandem and the magnificent view of the lake ! How is the landing ? Do not panic, there is nothing complicated! You just have to get back into the standing position, outside the harness, and then take a few steps when you put it down: with the modern sails, the landing is extremely soft. 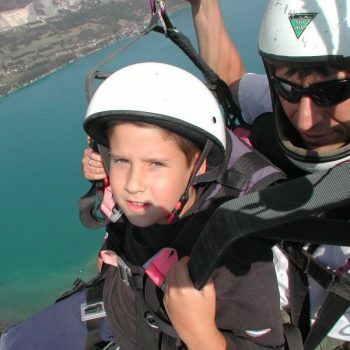 Why make your first paragliding flight Annecy ? The site of Forclaz at the other end of Annecy is an internationally known site ! It is one of the most famous sites in the world, because the aerology (winds) is ideally suited to paragliding ! In addition, the view is fantastic… Indeed, it is the most beautiful panorama you can have on Lake Annecy. The takeoff site is very soft and rounded. The landing field is huge and there is free parking next door. This huge landing is absolutely ideal for your paragliding baptism ! The landing area is located at the end of the lake at Doussard. This allows us to really fly over Lake Annecy. It’s one of the most beautiful moments of the flight ! In addition, calm aerology above the water will allow you, if you wish, to try to fly paragliding. After the flight, there is also the famous bar of JP, to recover from your emotions and celebrate with dignity your first flight in paraglide! “Paragliding jump” or “Paragliding flight” ? 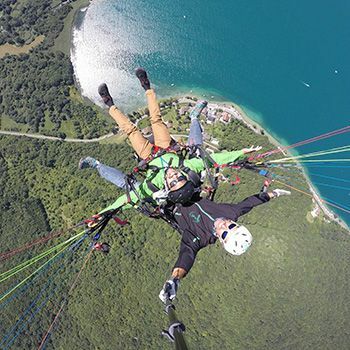 What are the sensations in Paragliding tandem flight Annecy ? It’s a sweet feeling and incredible contrary to what one might think ! If there is no acrobatics, you will discover the feeling of flying in the air in the greatest calm, above Lake Annecy. 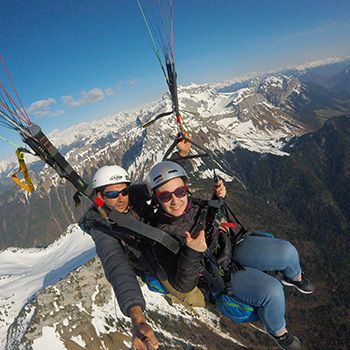 What constitutes a Paragliding tandem flight Annecy the most perfect … Our professional paragliding team in Annecy, offers paragliding baptisms every day of the year, in winter as in summer, to discover or rediscover the activity and the region of the lake Annecy. All flights are in two-seater sailing and supervised by a team of qualified professionals. 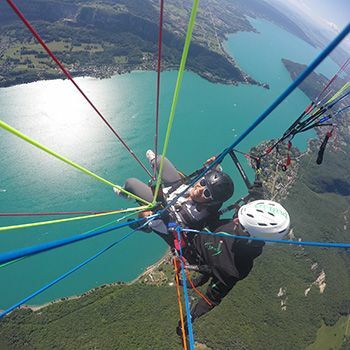 Questions about your paragliding tandem flight in Annecy ? Discover also our paragliding courses ?